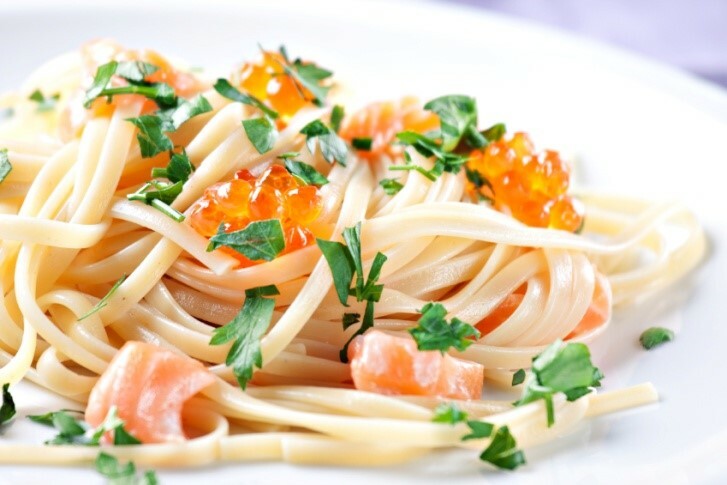 Salmon caviar adds a delicate crunch to this luxurious pasta dish for summer heat. Bring a large pot of water to a boil and add a large pinch of salt. Add the tagliarini and cook until al dente. Drain the pasta, reserving about 1/2 cup of the cooking water. In a large, deep skillet, melt the butter over moderate heat. When the foam subsides, add the minced shallot and cook over moderately low heat for 2 minutes, stirring. Add the crème fraîche, parsley and tarragon. Stir in about 1/4 cup of the reserved pasta cooking water and season with pepper. Add the pasta and smoked salmon ribbons and toss well. Add up to 2 more tablespoons of the reserved cooking water if the pasta seems too dry. Remove from the heat. Add three-fourths of the caviar and toss gently. Serve in shallow bowls, garnished with the remaining caviar. While typically Chardonnay does not pair well with most foods. With this dish try a rich, full-bodied minerally Chardonnay. Chef, Wineau and professional bon vivant Les Kincaid is one of today’s most imaginative food personalities. His artful approach to cooking, confidence-inspiring instructions, and contagious enthusiasm have endeared him to a loyal following that tune in to his weekly shows, frequent his wine or cooking classes and appearances, and collect his books.